You are here: Home / Which chart should I use? So, without further ado, let's start with rule no. 1. 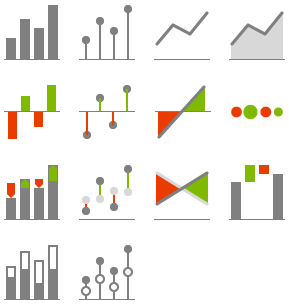 Let's focus on the most frequent business charts, such as column and bar charts, line and area charts, dot plots or pin charts, plus-minus (variance) charts, etc. Your first decision should always be whether to turn them horizontally or vertically. This means that your data categories are years, quarters, months, weeks, days or date/time values. That's it. Time should always run from left to right, never from top to bottom. It is a simple convention that everybody understands. Of course you can visualize other types of data categories with horizontal charts. But you will probably run into problems with labeling and category spacing. If you really want to make an exception to this rule, do it only when the number of data categories is very small and their labels (names) are short. When you have discrete items (categories or structure data, such as products, customers, accounts, etc. ), use vertically oriented charts, such as a vertical Bar chart, vertical Dot chart, vertical Waterfall chart or vertical Circle (Bubble) chart. Orientation When do I use it? BI/reporting/visualization tools usually offer a large set of chart types to choose from. So it is extremely important to understand and predict the nature of the analytic task that your readers will perform when observing your charts. You should always ask yourself: What message am I trying to convey? For example, you might simply want to show an interesting trend in monthly values. Or enable your readers to compare sales values of different products. Yet another time, you might expect that the readers need to understand the variance to budget, growth from previous year values or the contribution of specific products' variance to the total variance. Learn how to insert structure charts in Zebra BI. Time series (trend) analysis is a similar task to structure analysis but only performed when the data categories represent time (years, quarters, months, weeks, days). Learn how to perform time-series analysis in Zebra BI. Here users try to assess the relation of a part to the whole value (e.g. sales of one product to total sales of the company). The analysis exposes the "significance" of each part relative to the total value. Learn how to prepare part-to-whole comparisons in Zebra BI. 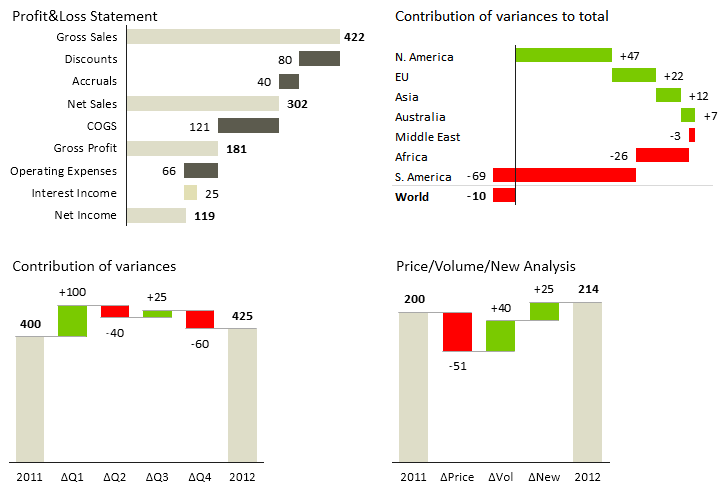 Zebra BI offers strong support for variance analysis. Read all about it here. With Zebra BI you can insert waterfall charts with just 1 click. Check out how to do it: Contribution Analysis - Waterfall Charts. 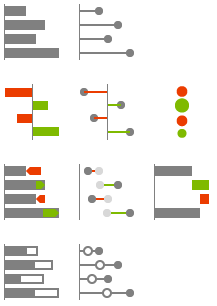 Once you have determined the correct chart orientation and the intended task of your visualization, you are ready for your last major decision: Which chart shape should I use? This decision is usually the hardest one. Why? Because it depends on many factors and you will also frequently bump into the dilemma whether to follow the laws of perception or rules of consistency. So let me explain these two in some more detail. The laws of perception determine how we perceive and interpret shapes. In reporting practice this means that users will comprehend different shapes and different organization of shapes differently. Therefore, the perception of a shape also affects the interpretation or at least affects the time of "understanding" the messages derived from your data. 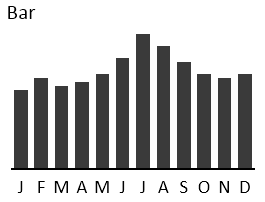 While the overall shape of a column chart allows us to see the trend, the vertical orientation of bars supports us in making single value comparisons (comparisons of height of two single values, such as Apr to May or Dec to Jul). The flow of the line emphasizes the trend, while the dots mark the height of a single value. There is much more emphasis on the continuation or the flow of the values (trend analysis), but still some support for single value comparisons. There is no explicit graphical support for single value comparisons, making it very hard to estimate the differences between particular months. 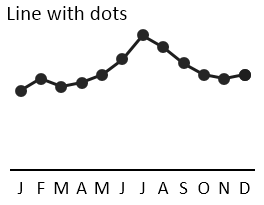 The only "gestalt" rule left is the continuity of the line, clearly exposing the trend in the data. Use the chart shapes on the left if single values (e.g. monthly figures) are important to the users and when you expect that users will compare values between each other (e.g. 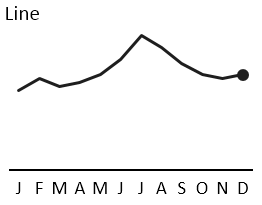 current month to previous month). Also note that this is only meaningful when charts are big enough. With small chart sizes or small category widths choose lines charts instead. Use the chart shapes on the right if you want the users to focus on overall trends. It is relatively easy to select the perfect chart and the perfect chart shape when you only have one chart. It's not rocket science and many researchers and authors have written guidelines on how to do this. But business reporting is so much more than just designing one single chart. In fact, most of the time you will have to use several charts at once to get the full message across to your readers. For example, you might need to design a whole report page or produce a full report with many pages, a BI dashboard with several hyperlinked screens, etc. And this is when you should start thinking about consistency as well. In the same way as traffic signs are expressed by consistent colors and shapes across the world, elements in business reports should be consistently designed to depict or "code" the same meaning with always the same shapes, colors and patterns, too! As you see the chart for the Price is much thinner than the one for the Revenue. This is quite intuitive, because revenue values are usually way bigger than prices (price is a ratio of revenue, divided by quantity). Once readers understand this, they will instantly know what they are looking at, even without reading all the labels. Guidelines like these are thoroughly covered in IBCS (International Business Communication Standards). With Zebra BI you can implement them in Excel with just one click. But remember, before you click to insert your perfect chart: Think about the 3 fundamental rules!